Please visit our bald eagle gallery to see more photos of these birds from the San Juan Islands. Deer Photo From TheRagens.com, August 2002. Before using our pictures, please review our usage policy. Photograph Notes: We took this picture in Yosemite National Park. 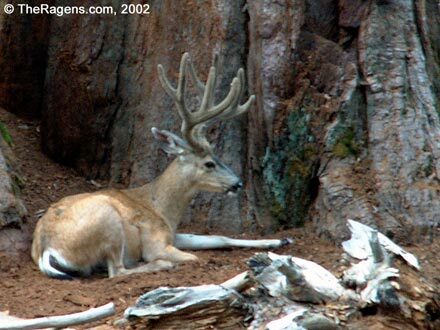 This beautiful buck was just resting quietly about thirty feet away from the trail at the base of a giant sequoia tree. He was resting so quietly that at least thirty people on the trail in front of us just walked right by without even noticing!